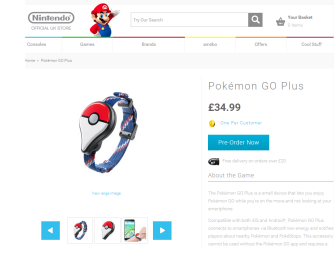 Nintendo has finally confirmed that the Pokemon GO Plus wearable wrist device will go on sale in the UK on Friday 16th September 2016. The device was originally due to be released in July however rumoured technical issues forced a delayed launch. The developers Niantic and Nintendo potentially have lost out on considerable sales as there were 45 million worldwide Pokemon GO users in mid-July compared to 30 million in August and probably even less during September at it's launch. The official Nintendo UK website are currently taking pre-orders for £34.99 including delivery. If you would like this device we highly recommend you pre-order Pokémon GO Plus as soon as possible before any potential stock shortages take hold. eBay prices are currently ranging between £59.99 and £94.00! The device is only currently officially compatible with Apple's iPhone, however an Android version is apparently under development. As with all products only time will tell if stock shortages become an issue in the approach to Christmas depending on how much the game has lost its appeal with its users.